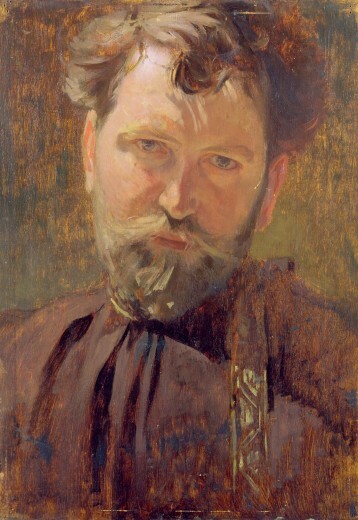 The self-portrait is a recurring theme in Mucha's paintings and photographs. In many of his self-portraits he wears an embroidered Russian shirt, a rubashka, which was orginally presented to him by his Russian painter friend David Widhopff (1867-1933). For Mucha and Widhopff the rubashka symbolised Slav unity and this style became Mucha's trademark. This self-portrait was painted in 1899, the year of his first visit to the Balkans, a trip which heightened his nationalist consciousness. In his usual style (here wearing a brown version of the rubashka), the artist looks penetratingly into his own eyes in the mirror, as if examining his mind. While his clothes and features such as his hair and beard are rendered with free, impressionistic brushstrokes over a thinly painted background, the detailed representation of the luminous eyes conveys his intense feelings.